Renault has appointed a temporary deputy chief executive to take over the running of the French car firm following the arrest of Carlos Ghosn. Renault said its chief operating officer, Thierry Bolloré, would step up to the role because Mr Ghosn was "temporarily incapacitated". Following an emergency board meeting, Renault said Mr Ghosn would remain as its chairman and chief executive. But it said Mr Bolloré would lead the firm with the same powers as Mr Ghosn. Mr Ghosn was arrested in Japan on Monday after allegations of financial misconduct. As well as Renault, he is also chairman of both Nissan and Mitsubishi Motors and leads an alliance of the three carmakers. Japanese prosecutors say Mr Ghosn under-reported his income from running Nissan by 5bn yen (£34.5m) over five years. 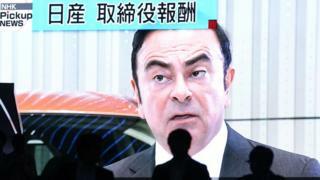 On Tuesday evening, Renault said: "At this stage, the board is unable to comment on the evidence seemingly gathered against Mr Ghosn by Nissan and the Japanese judicial authorities." Meanwhile, the Financial Times reports that Mr Ghosn was planning a merger between Renault and Nissan but that the Japanese company was opposed to a deal. Mr Bolloré is already in charge of many day-to-day activities at Renault. The company said its decision to name him as deputy chief executive was a "transitional governance" measure "to preserve the interests of the group and the continuity of its operations". Earlier, French Finance Minister Bruno Le Maire said Mr Ghosn was "no longer in a position" to lead the carmaker in which the French state has a 15% stake. He also said Renault's partnership with Nissan remained in the interests of both France and Japan and of both companies. But Mitsubishi Motors chief executive Osamu Masuko said the alliance would be difficult to manage without Mr Ghosn. Nissan has a 34% controlling stake in the smaller Japanese carmaker. In a press conference on Monday, Nissan said an internal investigation prompted by a whistleblower had revealed "significant acts of misconduct" including "personal use of company assets". Nissan chief executive Hiroto Saikawa said "too much authority was given to one person in terms of governance". "I have to say that this is a dark side of the Ghosn era which lasted for a long time," he said, adding he was still debating whether Mr Ghosn was "a charismatic figure or a tyrant". Prosecutors later said in a statement that Mr Ghosn and senior executive Greg Kelly had conspired to understate Mr Ghosn's compensation, starting in 2010. Japanese prosecutors also said they had already raided Nissan's Yokohama headquarters, near Tokyo, as part of their investigation. Nissan chief executive Mr Saikawa insisted the partnership would "not be affected by this event".